Choices are tough. Americans have a major choice to make on November 8th. 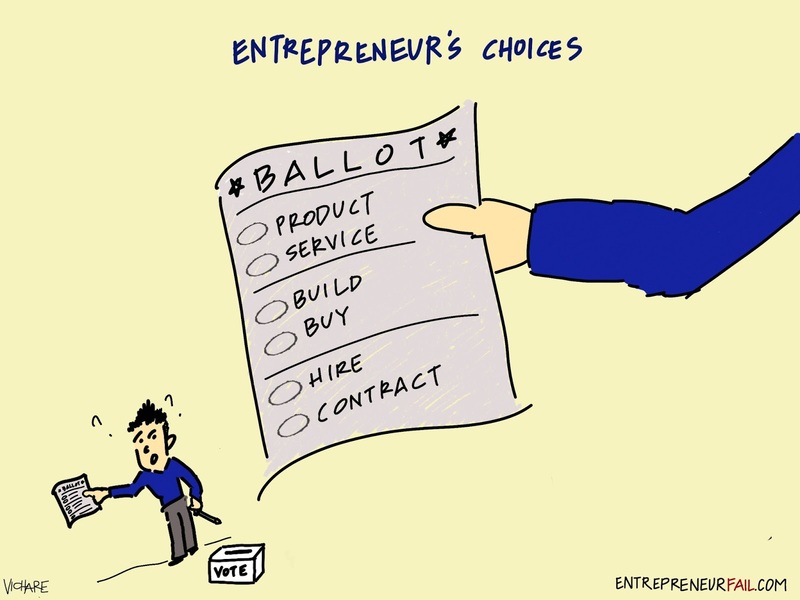 New entrepreneurs also have important selections to make. Product vs. Service - There are advantages to either strategy. Products are generally more scalable but require upfront investments. Services, on the other hand, are harder to scale, but can be executed with lower upfront investments. Often entrepreneurs start by providing a service, and when they see the potential, they shift to a product opportunity. Build vs. Buy - A new entrepreneur may feel inclined to build everything from scratch instead of buying or subscribing to an existing solution. The former often takes longer and requires more spend. Weigh your individual solution and determine what makes sense to pursue. Permanant Hire vs. Contract - New hires are sometimes less expensive hourly, but require training and alignment. Contract hires are expensive but they usually have the expertise required. Starting with the contract route may provide the early flexibility new entrepreneurs need, after which permanent hires may prove more sustainable. What are other important elections and selections you have had to make in your startup? Happy voting! When you have more profits in building than you will build instead of buying so the time has come when we have to click here to choose what we need to do in this time to save time and money. If you understand the difference so you can see that when you visit site and understand the need of difference so you can create your own trial and mark the posts you need to make in the coming days. This is true that we have to choose things wisely so that you can proud on decisions in future. For this if you need more help you can consider online services. Excellent blog post, Preparing demonstrates to an individual proper methodologies to live adequately in an overall population and how to achieve his goals by his tenacious work. Most professionaltypist.net/how-our-fastest-typist-works/ give tips yet we will absolutely satisfy you. Hello, I am a writer and I work in custom essays. You can ask for help with all your academic writings here. Than you for your attention.